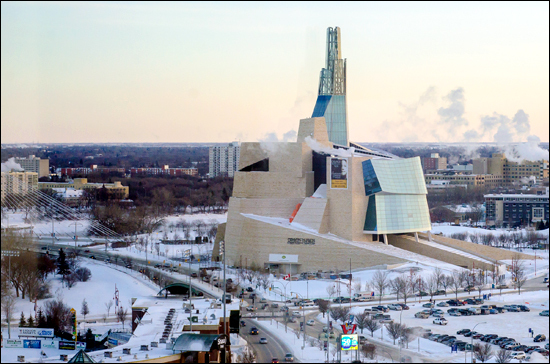 There are no secrets you need to know about the CMHR, though. It joins the Chateau Frontenac in Quebec City, the Parliament buildings in Ottawa, and Toronto’s CN Tower as the notable architectural landmarks in a country whose cities have been far too focused on building pricey hotel/condo towers than fantastic public spaces. When the Art Gallery of Ontario unveiled its Frank Gehry upgrades in 2008, hundreds in Toronto lined up for hours to enter. That was for a renovation. It is the first national museum constructed since 1967 and will be the only one built outside of Ottawa. In August, the world’s travel media will arrive in Winnipeg to glimpse the city’s new star attraction a month before it opens. The annual Go Media conference (of which I am helping to coordinate) will launch a series of promotions to raise awareness of this one-of-a-kind museum whose stated purpose is to promote reflection and action about human-rights issues around the planet, including those related to First Nations in Canada. A statue of Gandhi is outside the building. You can be sure Nelson Mandela will feature prominently in the 47,000 square feet of exhibit space. Interactive displays will allow visitors the chance to debate human-rights cases and consider different positions on particular topics. Those interactions will take place in a building flooded with light and constructed with basalt and alabaster, climbing more than 100 metres to the peak of the Tower of Hope, from which you can peer down on the staggeringly beautiful structure while standing atop a small platform and holding your breath and thinking to yourself, Ok, I’m really glad I came to Winnipeg.